Quite frankly, it’s not all that often that we Americans begin our sentences with a letter Q. 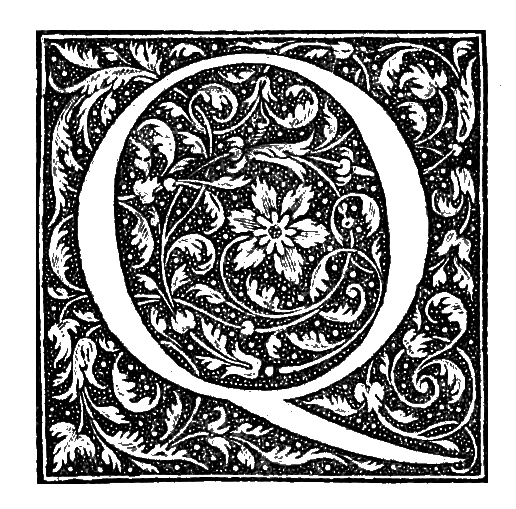 The vintage letter Q image I’m sharing here is from an old botany book that was written in Latin – a language that far more often begins sentences with words beginning with a Q.
What’s even more fun about this vintage letter Q image is just how vintage it truly is – it’s from 1651. And, it’s my favorite among the ones I have found and shared with you so far. For a drop cap image, this one’s a great size; so many of them have been half this size or even smaller. The quality of this one is great as well. It features a white letter Q on a black background. Surrounding the Q are leaves and vines with a lovely flower in the very center of everything. It would be stunning colorized. Just think of using some of your markers or colored pencils to customize this vintage letter Q image to fit your project’s design.